Just a month after Vietnam’s Justice Ministry announced it was setting up a consultative committee to review the issue of gay marriage in the country, Vietnam’s first Gay Pride event takes place in Hanoi this coming week-end. Although small in scale, it will have a cycle parade through the city on Sunday. Being gay is not illegal in Vietnam, but like many other countries there are still taboos, discrimination and negative perceptions to be overcome. 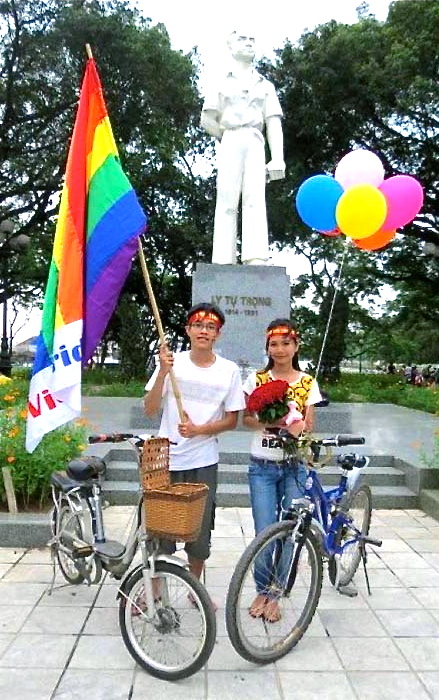 The cycle parade through Hanoi appears to have drawn between 100 and 180 participants. Organisers report no harassment from authorities. Was any poster there, I wonder?